Home » Blogs » Charles Gaba's blog » The RAND Survey is out! Conclusion: NET insurance gain of 9.3M! The RAND Survey is out! Conclusion: NET insurance gain of 9.3M! At last, the big RAND Survey that everyone was freaking out about (and in some cases, completely misinterpreting) has actually been released! Using a survey fielded by the RAND American Life Panel, we estimate a net gain of 9.3 million in the number of American adults with health insurance coverage from September 2013 to mid-March 2014. The net result, according to RAND? An overall drop in the adult uninsured rate from 20.5% to 15.8%, or around 9.3M people nationally. Put another way, the survey estimates that the share of uninsured American adults has dropped over the measured period from 20.5 percent to 15.8 percent. Among those gaining coverage, most enrolled through employer-sponsored coverage or Medicaid. Assuming the RAND study is accurate (and most people from both sides of the aisle seem to think it's a pretty solid source), we may finally have an answer to the question "How many of them were UNINSURED???" Answer? 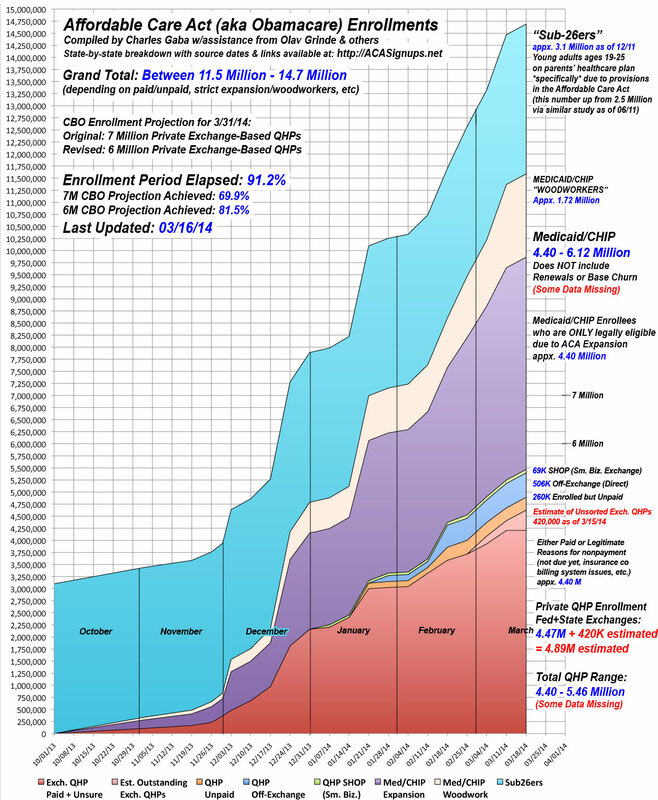 Around 36%...of the first 3.9 million enrolled! That's right: Their study doesn't even include the 3.2 million more people who enrolled in individual QHPs via the exchanges after the survey concluded! Although a total of 3.9 million people enrolled in marketplace plans, only 1.4 million of these individuals were previously uninsured. Our marketplace enrollment numbers are lower than those reported by the federal government at least in part because our data do not fully capture the surge in enrollment that occurred in late March 2014. Of the 40.7 million who were uninsured in 2013, 14.5 million gained coverage, but 5.2 million of the insured lost coverage, for a net gain in coverage of approximately 9.3 million. This represents a drop in the share of the population that is uninsured from 20.5 percent to 15.8 percent. Enrollment in ESI increased by 8.2 million. Take a look at the Medicaid tally as well...5.9 million. While this appears to be right in between my current 5M "strict expansion" figure and the 7M "strict expansion, again, you'd have to go back to mid-March to compare apples to apples. As it happens, again, looking at The Graph from March 16: Including both "strict expansion" and "woodworkers", my estimate at that time was 6.12 million. Medicaid enrollment increased by 5.9 million. New enrollees are primarily drawn from those who were uninsured in 2013, or those who had “other” forms of insurance, including Medicare, retiree health insurance, and other government plans. Now, the 3.9 million enrollee figure "as of mid-March" seems a bit odd, since the total through 3/01 was 4.242 million, and as of mid-March I had the total exchange QHPs at around 4.89M as of that time. However, I'm assuming that RAND's "were covered" refers to paid enrollments as of 3/16, which would be about 80% of the 4.89M total. According to our estimates, 3.9 million were covered through the state and federal marketplaces as of mid-March 2014. This figure does not fully capture the enrollment surge that occurred in late March. Among the 7.8 million people who were enrolled in off-marketplace individual market plans in early 2014, 7.3 million were previously insured; 5.4 million were previously insured through an individual market plan. There's a LOT to absorb here, but so far the biggest question I have is why they keep listing the "enrolled through mid-March on the exchanges" number as 3.9M instead of around 4.9M as of that time. The only thing that makes sense to me is that they're assuming an 80% payment rate. If anyone has any better explanation, feel free to correct me on this. Assuming I'm correct about this, I'd say my data & estimates as of mid-March lines up pretty damned closely to RAND's. Am I wrong?